The Ram ProMaster marks Chrysler’s first full-size van since the Dodge B-van that carted so many people to airports and religious retreats. Although ProMaster is new to the American market there are millions of them on the roads of Europe wearing Fiat Ducato badges. ProMaster is offered in conventional cargo van layout, a cargo van with windows (which can be made into a passenger van at a facility adjacent the factory), a chassis cab more like a flat-bed, and a cutaway van suitable for adding your own box van and likely to be popular with Class C motorhome builders. From three weight classes, four body styles, three wheelbases and two roof heights offer 14 configurations. A 280-hp 3.6-liter gasoline V6 and 6-speed automatic derived from those in Ram’s cargo van and Chrysler vans is standard on all. The alternative for every ProMaster is a 174-hp 3-liter four-cylinder diesel coupled to a 6-speed automated manual transmission. Ram ProMaster is a front-wheel-drive van. In addition to any traction benefit in inclement weather and less hardware running front to back, that means a low load floor and big doors that will clear a standard pallet; a sliding driver’s-side door and various window options for working out of it are available. Top load and tow ratings clear 5000 pounds, though not coincidentally. Interior cargo volume ranges from 283 cubic feet to 530 cubic feet. Up to 17 cargo securement points are included. The driving position is upright with an excellent view forward and good mirrors. Two seats are standard, a double passenger seat offered, and the passenger version is expected to carry 12 individuals. Controls are simple, the floor is unobstructed and navigation and Bluetooth are offered. Maximum space efficiency means a box shape, so consider ProMaster’s slab sides a blank canvas to improve its looks with your graphics. The big front bumper/grille assembly is three parts to lower replacement/repair costs of fender benders, and the mirrors and paint are the only things you can easily scrape off it. ProMaster competes against Mercedes-Benz Sprinter, Ford’s outgoing E-van and upcoming Transit, Nissan NV, Chevrolet Express, and GMC Savana. 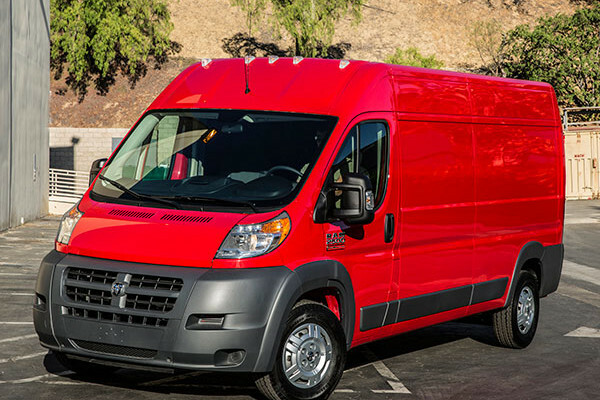 Ram offers 14 ProMaster configurations. All of them come with a 280-hp gasoline V6, 6-speed automatic transmission and front-wheel drive. A 174-hp four-cylinder turbodiesel and 6-speed automated manual transmission are available on any ProMaster. Cargo van choices include a short-wheelbase (118-inch) low-roof 1500, low- and high-roof medium-wheelbase (136-inch) 1500, medium- and long- (159-inch) wheelbase high-roof 2500, and long-wheelbase high-roof 3500 in standard or extended body (14 inches longer). Chassis cabs and Cutaway are 3500 136 or 159-inch wheelbase low roof with cab-to-axle of 81 or 104 inches. All have wider mirror mounts for 8-foot wide bodies. The Window van is a 159-inch wheelbase, high roof 2500. Window vans use tinted glass for rear windows, and touring rear suspension. All ProMasters come with cloth upholstery, air conditioning, six-way manual front seats, telescoping steering wheel, power locks/one-touch windows, remote entry, 16-inch steel wheels, full-size spare tire and USB charge port. Options include: heated front seats, swiveling front seats, engine block heater, aluminum wheels, wood floor cargo area, various floor mats, dual passenger seat with fold-down console, leather wrapped steering wheel, Bluetooth hands-free, UConnect 5.0 stereo, SiriusXM satellite radio, navigation, smokers pack, bright grille and fog lamps, and a forward convenience package (overhead tray, locking glovebox, windshield document clip). Cargo vans may be ordered with a driver’s side sliding door with or without window. Safety features include front, front side impact and side-curtain airbags, tire pressure monitors and electronic stability control with trailer sway control. Optional on cargo and passenger vans are a backup camera and rear park assist. Like most vans, Ram ProMaster is a rectangular box with a sloping nose. From dead-ahead it could be jolly robot in an animated film. Lights are mounted high front and rear for visibility and impact protection. Ram has added the horn logo and cross-hair grille to the expanse of black plastic but it doesn't have the aggressive or sporty nature of any other Ram, including their minivan based Cargo Van. Sectional construction saves changing the entire bumper for a damaged corner, and steps in the corners make it easier to scrape dead bugs off the windshield. Side mirrors have separate wide-angle elements and all four lenses are available with power adjustment. Apart from the mirrors and door handles, everything on the sides is horizontal. The side door has a 62-inch wide opening; open height is 60 or 72 inches depending on roof. Windows are available for side doors, rear doors, and the fixed rear side panels. Cargo van glass is all clear, while passenger van models get tinted rear glass. The rear barn doors open at 180 degrees or to 260, nearly flat along the van sides, and the rear step surface is non-slip. Cargo tie-down points number up to 17: Up to 12 on the floor rated at 1,000 pounds each, and up to five on the walls rated at 500 pounds each. The roof has three rail mounts and tapping plates on each side and is rated for a 400-pound load; remember it's 8.5 feet high on high roof models. Though most will be white there are seven other colors to choose from. You can also add some chrome touches and aluminum wheels for style and less rotating mass. Ram ProMaster is built first and foremost as a commercial vehicle. If it doesn't aid productivity or ease serviceability, or it does add expense, don't expect to find it here. There are plenty of custom shops that can turn it into a limo or private jet cabin if you wish. Hop into the driver's seat because it is well off the ground where the view near and far is excellent. A few levers make quick seat adjustment, and both heated and swiveling seats are available. Because of the upright seating position, heavily angled steering wheel and telescope-only (no tilt) adjustment you might feel you need long arms and short legs if you use any more than the bottom third of the wheel. Instruments are simple white-on-black with an amber-screen trip computer. The key is a Fiat part, the climate control and UConnect system and controls just like those in a Ram pickup. The dash-mount shifter is handy above your right knee and the handbrake out of the way on the left of the seat. Dual stalks on the left side of the steering column may require familiarization, and some will find the pedals close together but there is left-foot space and a decent dead pedal. Beverage holders are plentiful and storage areas varied. A clip on top of the dash can hold your delivery papers, and the overhead console more loose debris. Given the commercial grade of some hardware like the sun visor mounts the overhead tray felt a bit flimsy in comparison, but you don't want anything heavy up there anyway. The load floor is a few inches below the driver's area floor, and just 21 inches off the ground (that's one inch higher than the step on a competitor); fewer big climbs or dropping the big appliance on its face. The cargo floor, available in wood, is 105, 123, 146 or 160 inches long based on configuration, and the tied-won points don't inhibit sliding pallets in. Likewise cargo volume varies by configuration, from 283 to 530 cubic feet. The difference between a standard and high-roof 1500, or a medium and long-wheelbase 2500 high-roof, is about 50 cubic feet. The smallest ProMaster cargo van is 8 inches shorter than a 2014 Honda Odyssey or 2015 Chevy Tahoe but, with only front seat in use, has nearly twice the cargo area of the Odyssey and three times that of the Tahoe. The ProMaster feels surprisingly lively with the gas V6 because it has plenty of horsepower, short gearing and doesn’t weigh much more than a Chrysler van or Ram 2WD pickup that share the engine. In a suburban jaunt through lightly trafficked, moderate-speed roads it averaged 18 mpg by trip computer, but fuel economy will vary widely by driver, application and engine. There is a smidgen of torque steer but nothing that requires two hands or a firm grip, and it works through the gears seamlessly. (Torque steer is common on front-wheel-drive vehicles and is often felt as a tug on the steering wheel when accelerating hard and turning at the same time, for example turning right at an intersection.) Interstate travel wasn’t on our agenda but higher speeds tended to generate more wind and road noise than mechanical. The diesel engine will be offered a little later than the van’s debut. It offers more low-rpm torque than the gas engine (295 lb-ft at 1400 rpm) and in other markets averages in the 25-30 U.S. mpg range. It will come with an automated 6-speed transmission: a manual gearbox which does the clutch and shifting action for you. BMW, Ferrari, Lamborghini and others have sold cars with the same type of transmission so it’s not unproven. Maneuverability is a ProMaster forte, the middle-length wheelbase able to execute a U-turn in less than 41 feet. It steers easily and generally goes where you point. Brembo brakes felt stout and required little pedal effort, but given we were allowed to drive with 1200 pounds of load in back we never asked for max effort. The ride was better with that load (about 1/3 of rated maximum) but still firm and controlled. You can sense you’re up higher and the vehicle is taller than it is wide, but in the unlikely event you manage to override all the stability systems and knock one over, the slab sides will stop it. Our suspicion is that best loading puts heavier cargo just ahead of the rear axle line; some versions have enough length that putting it all by the back door will make it feel like an unbalanced trailer was added. The ProMaster can tow up to 5,100 pounds, won’t need a big ball-mount drop, and does have trailer-sway control logic in its stability program, but we found no mention of an integrated trailer brake controller and would recommend brakes on any trailer more than 500-1000 pounds regardless of state requirements. As always, follow the manufacturer’s requirements. The ProMaster brings a front-drive choice to the full-size van market, and more than two million on the road suggests that works for plenty of people. With gas or diesel power, a variety of configurations and a human-friendly floor height one should fit your hauling, service or transportation needs. NewCarTestDrive.com correspondent G.R. Whale filed this report after his test drive of various ProMaster models in California.